Very strong damage against 1 enemy ignoring defense buff. 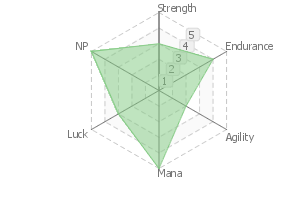 Increases party's Quick and Buster performance by 10%, while she is on the field. Raikou heard about the considerable disturbance of public morals that took place on the southern island previously. “Such situation must not happen in this year’s event” - a compulsory Class Change resulted from her dedicating such prayer to the Gozu Tennou. 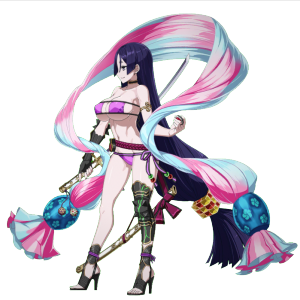 Although not to the extent of her proper Class (Saber), Lancer Minamoto Raikou accomplished a metamorphosis in which her motherly power was inhibited and the disposition of protecting the capital was strengthened. In other words, a Sukeban. 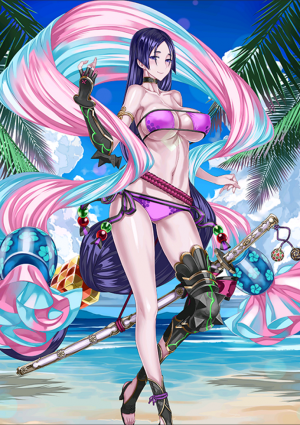 With her motherly power inhibited, Raikou cuts off the summer as a dignified warrior that protects the capital! Surprisingly, it seems that this time she has no Mental Pollution skill (unsubstantiated assertion). In order to crack down on the public morals, Raikou turned into a Public Morals Chairwoman of the shadows. 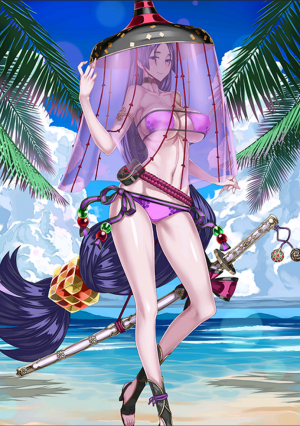 She has no interest in the outcome of the race that Ishtar is holding and is purely thinking about monitoring the participants that are more likely to take the chance provided by the summer event to cut loose too much. Upon accomplishing her third Ascension, she will end up throwing off her sailor uniform due getting into high-spirits and, as a result, bring about a situation where she is the one disturbing public morals the most... but the concerned person has no self-awareness at all. Wait, does she...? A skill that strengthens physical abilities in exchange of reason. Although her mentality is still somewhat broken even after becoming a Lancer, there is still a great difference when compared to when she is a Berserker. She has a sense of morals. 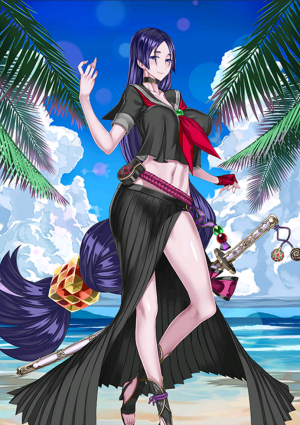 By means of a moral sense, the Lancer Minamoto Raikou monitors disturbances in the public morals of the summer holidays. A variation of the Eternal Arms Mastership skill. No matter in what kind of situation - such as losing her sailor uniform - she will not overlook disturbances of public morals. 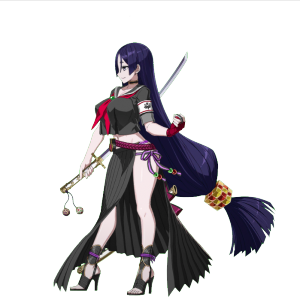 “When you say sailor uniform, then it should be this” - such misconception from Kintoki ended up infecting Raikou. 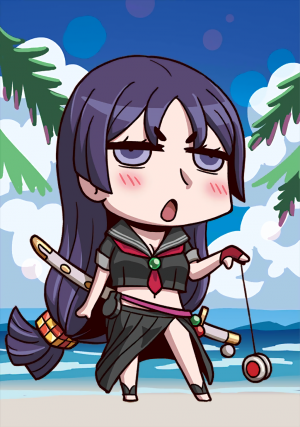 That Raikou (who embodies all martial arts) perfectly handles a steel yo-yo and drives away any and all summer temptations that attempts to disturb Chaldea’s public morals. It is already amazing without her stripping--- but things become even more amazing once she strips. A skill falsely similar to Summer Crisis, which denotes how much of people’s stares one ends up gathering on the beach. Unlike Beach Flower, it even concentrates gazes that deviate from the domain of yearning. Thanks to this Noble Phantasm, at this occasion Raikou’s Class was ultimately established as a Lancer. Its shape is that of a tokkosho, which is said to represent the tathata - the real form of all creation according to Vajrayana teachings. As expected, she is unaware! ?